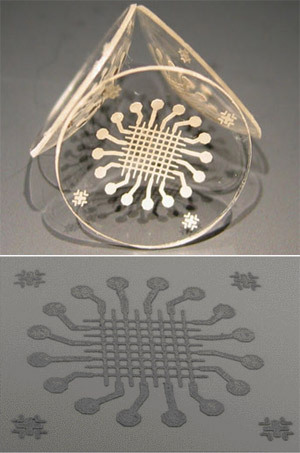 Pressure-sensing contact lenses developed by University of California researchers have an embedded pressure sensor. This could lead to glaucoma-sensing contact lenses able to continuously monitor the eye. In their 1992 story The California Voodoo Game, Larry Niven and Steven Barnes wrote about scleral contact lenses with embedded circuitry. In a 2001 story, Fast Times at Fairmont High, Vernor Vinge wrote about smart contact lenses with embedded circuitry. This field is progressing in real life; see Circuit Smart Contact Lens, Presaged by Niven, Barnes and Vinge.